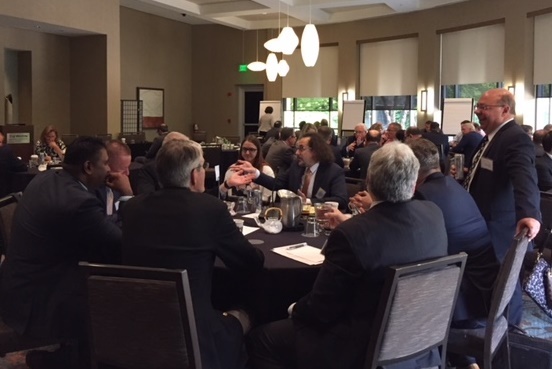 At ASNC's 2018 Industry Forum last month, more than 30 representatives from 15 companies joined the Society's Board of Directors and staff for a day-long discussion of contemporary imaging needs and how to continue improving nuclear cardiology to meet those needs. Moderated by ASNC 2018 President Prem Soman, MD, PhD, FASNC, the annual event featured speakers from cardiovascular subspecialties, including interventional cardiology, heart failure, electrophysiology, and the growing area of cardiac amyloidosis, each of whom outlined problems their fields are tackling and, importantly, how nuclear cardiology could help. Speakers from ASNC's industry partners shared insights into research and development in today's value-based environment, highlighting challenges companies face in bringing products to market and their priorities as they continue improving SPECT, PET and other imaging modalities. The Forum yielded a list of efforts ASNC could focus on—in collaboration with various partners—to continue accelerating the field's growth in support of optimal patient care. In a comprehensive debrief following the Industry Forum, ASNC's Board analyzed each concept and assigned initial “exploratory” tasks to various ASNC committees and task forces. Specifically, the potential priorities include (1) standardizing protocols for myocardial blood flow quantification, (2) developing registry modules and research around cardiac amyloidosis, and (3) diversifying ASNC's educational portfolio in parallel with both efforts to serve an expanding range of participants. As ASNC explores each priority and develops a plan for operationalization, member engagement will be essential. Dr. Soman asks members to watch for communications from him and ASNC staff and to participate as much as possible, from responding to queries and surveys to joining working groups. Stay tuned. There's much more to come as ASNC and the nuclear cardiology community jointly shape the future.